Start your tour of the Philippines in Luzon - the northernmost region of the country, which is also known as the economic and political center of the country, having Manila as its capital; and check out these top places to visit, for priceless, dazzling fun and adventure guaranteed! 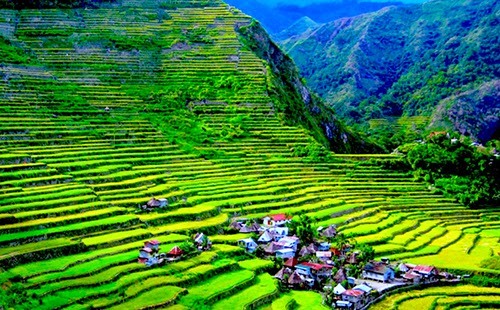 Dubbed as the 8th Wonder of the World by Filipinos, Banaue Rice Terraces, are located approximately 1,500 meters (5000 ft) above sea level; and if its steps were put end to end, it would encircle half the globe, according to Wikipedia. This awesome site is 2000 years old, and is believed to have been carved mostly by the hands of the ancestors of the Ifugao people, with minimal equipment. Would-be tourists for Banaue Rice Terraces are advised to book a tricycle (small three -wheeled vehicle, run using a motorbike) from the tourist office at the main road to be able to reach the interesting view points. Recently, the fee is only about Php 750 (about $17), and there is just a very minimal entrance fee for the Batad stop. Furthermore, it is recommended to at least stay overnight at the accommodation nearby for a more wonderful experience of this very captivating spot in Luzon. Also known as Mount Mayon, Mayon Volcano, the main landmark of the Philippine’s Albay Province, rises 2,462 meters (8,077 feet) from the shores of the Gulf of Albay about 10 kilometers (6.2 miles) away. Mount Mayon is truly a mesmerizing countryside view, especially when peaceful, and symmetrically, this volcano has THE most perfectly-shaped cone in the world. Ironically though, amidst its being very attractive, it is also the most active volcano in the entire Philippines, with over 49 eruptions in the past 400 years. Both local and foreigner peeps have died, either by seeking thrill over climbing it, or merely by being residents nearby. Amazingly, this scenario never puts a stop towards its being always at the top, as one of the most important spots for tourists in our beloved Philippines, be it for the adventurous Filipinos out there, or for international tourists who are curious to know how it would feel to personally behold such splendor and majesty. Significant for its 17,206 graves for U.S. personnel killed during World War II, including those of war dead from the Philippines and other allied nations, that died within the years, 1941 – 1945; the Manila American Cemetery and Memorial, located in Fort Bonifacio, Metro Manila, has the largest number of graves of any cemetery for U.S. personnel killed during World War II, according to Wikipedia. This institutional tribute to war heroes, show white marble crosses as headstones, amidst a beautiful lawn with equally well-maintained trees and shrubs. Other important must-see in Manila American Cemetery and Memorial, are the bronze murals and mosaic maps, that have explanations of the major Pacific campaigns of World War II. It’s worth an hour or two of your time, which you can use as a moment of reflection and prayer for all those who laid their lives down during the Second World War, in quest for peace. Looking for cooler fun and adventure? Try spelunking in the centuries – old Sumaguing Cave, with an accredited Sagada guide. Just register at the Tourist Information Center in the town and they shall arrange for your exploration of this ever-famous cave – gifted by nature with awesomely unusual rock or limestone formations. There are 3 levels of spelunking activities to choose from, the first one taking just about 2 hours within the Sumaguing Cave; otherwise, for more challenge and excitement, you can book for the two other more difficult levels that do the cave connections, which means you will go from one cave to another, and thus, taking a longer route. Perfect balance and focus are required to successfully finish this activity, alongside your stamina and sense of fun for something new or exciting like studying a cave, as magnificent as the Sumaguing Cave in Sagada. Also, your own head lamp may be a great tool to fully enjoy this activity; otherwise, you can just depend on the gas lamps of your excellent guides, who have mastered every slope and steep of these astonishing caves in Sagada. Definitely a must – try challenge, especially for those who would like develop or have already developed trust in their abilities that would also welcome a new kind of sport, which is, of braving untouched places on Earth, which have been here for millions of years, even before man was created; just like the wonderful gem, Sumaguing Cave of Northern Philippines. Spectacular! Another yet pride of the Philippines, is the third highest mountain in the country – Mount Pulag. Standing so tall at 2,922 meters above sea level, it is a favorite tourist destination of hikers and nature-lovers alike – especially since they get to see the Milky Way Galaxy at dawn and enjoy the coolest temperature in the Philippines amidst its “sea of clouds”, at the peak. Consider visiting on a weekday, instead of on a weekend, to avoid the huge crowd of mountaineers that jam-pack Mount Pulag, specifically to catch a view of the sunrise from its peak – which is a heavenly experience, we must say! Moreover, say hello to its different species of plants and animals, considered as one of the most diverse biodiversity of the Philippines – namely, the Dwarf Bamboo, Benguet Pine, 33 bird species and several endangered animals, like the Philippine Deer, Giant Bushy – Tailed Clout Rat, Koch Pitta Bird, etc. Truly one for your bucket list! Don’t get stuck in a rut anymore, explore exciting Luzon now!